Decodable books for older students must support systematic phonics instruction while at the same time engaging older students’ interests. In this post, I’ll get into what makes an engaging book for middle school and high school students. We’ll look at some of the “hooks” Victoria has used in writing the decodable texts in our app for iOS and Android. 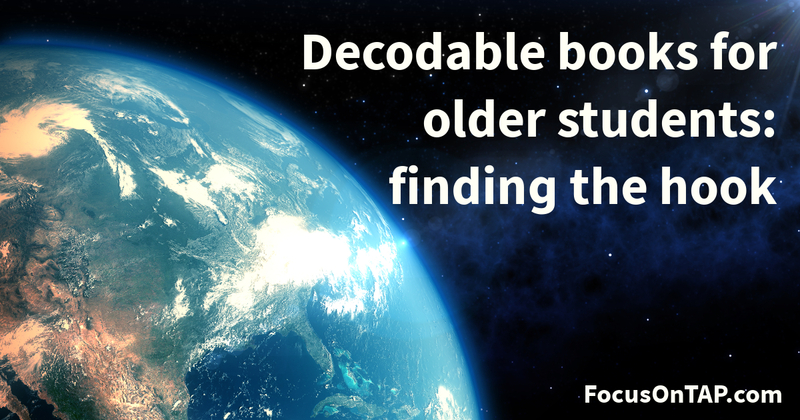 Lastly, I’ve included some information about decodable books for older students if you mean “older than 6 or 7”. At this age they’re social, curious, beginning to pull [away] from their parents to forge their own identity, and fine-tuning their sense of humor. Thus, books that expand their view of the world or poke fun at the world they know (family, friends, puberty, school social dynamics) hold a lot of appeal, as do imagined worlds of science fiction and fantasy. In the introduction to her list of 20 YA (young adult) books for older teen reluctant readers over at BookRiot.com, Kelly Jensen says that teen reluctant readers will like books that “have a good pace, a solid hook to “sell” to the reader (i.e., you can give them the book’s description in a sentence), compelling characters, straightforward writing, and easy to imagine”. These characteristics are even more important in decodable books for older readers because these readers have often had a lot of negative experiences with books and reading. In Bad, Tom deals with moving to a tough, new neighbourhood and supporting his mom though hard times. The Dog Man had a great girlfriend and a great job but some not-so-great business partners and that leads to trouble. Max has to take the dreaded Gas Test and discover what his future holds in the dystopian sci-fi world of The Gas Men. Kat is pregnant and not sure who to turn to for help but learns who her true friends are in Kid Mom. Kate is crushing hard on Jake in Life is a Joke (coming this Fall). Will she get up the nerve to tell him? The characters in these stories struggle with challenges and choices likely to be familiar to many older beginner readers. Kate is dyslexic but loves expressing herself with the help of assistive tech. Tom is beginning to see a future for himself as an auto mechanic and finds a mentor. Max lives in a world of rules that don’t seem to make sense. Kat loves her parents but isn’t sure of their support for her given some choices she’s made and now regrets. The treatment of friendship and romance, ambition and conflict found in these decodable books for older students is similar to what is found in any YA (young adult) fiction. A Bit Heavy For Your Pre-Teens? What if you’re looking for phonics books for struggling readers as young as 8?The themes in the TAP Library may be a bit heavy as this reviewer on Common Sense Media pointed out. The Moon Dogs series from PhonicsBooks could be a good option. It offers “a story line based on the adventures of a group of teenage friends in a band” with fun, comic-book style illustrations. The publisher also describes these as “catch-up readers”. Level 2 of our phonics progression is similar to the phonics content of the books in Set 2 of this series. Although this is a quality series of books, they may strike older students in middle school and high school as being “for babies”. It depends on the student. And, of course, unlike the decodables delivered in our app, teens can’t read them on their beloved smartphones. ← Examples of open syllable words in pop music lyrics!